Meader: Conventional pollinating species, of which only the female bears fruit. The Zhong-Hua has three subvarieties: the “Yellow flesh”–average weight, 30.2 g; sugar content, 9.0%; ascorbic acid 101.9 mg per 100 g.
Second subvariety is the “Green flesh”–average weight 18.4 g; sugar content, 5.4 %; ascorbic acid, 55.7 mg per 100 g.
Third subvariety is the “Yellow-green” and “Green-yellow”–average weight 31 to 48 g; sugar content 5.4%; ascorbic acid 85.5 mg per 100 g. It is not suitable for making jam or for canning purposes. 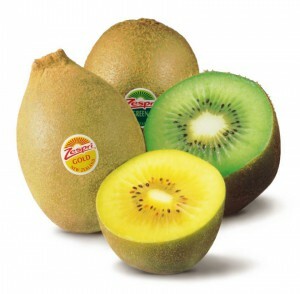 1) Qing Yuan #17–fruit weighs a maximum of 70.3 g; skin is yellow-brown, smooth, thin; flesh is juicy and of excellent flavor; sugar content 8.2%; ascorbic acid, 169.7 mg per 100 g. Rated as a kiwifruit species of superior quality. 2) Qing Yuan #22–fruit has maximum weight of 67 g, average is 47.3 g; skin is yellow-brown, smooth, thin; sugar content 7.9%; ascorbic acid, 11.42 mg per 100 g. Of high quality. 3) Qing Yuan #28–fruit cylindrical; weighs a maximum of 46 g; averages 40.6 g. Skin is smooth; flesh fine-textured and juicy. Sugar content 9.1%; ascorbic acid 103.2 mg per 100 g. Of medium quality. 4) Qing Yuan #18–fruit cylindrical; maximum weight 56 g, average 36 g; flesh very tender, medium juicy, of good flavor. Ascorbic acid content 178.9 mg per 100 g. Good fresh and for processing. 5) Qing Yuan #20–small, elongated cylindrical; maximum weight 26 g; average 21.5 g. Sugar content 12.4%; ascorbic acid, 189.2 mg per 100 g. Excellent quality. 6) ‘Long Quan #3‘–oblate; average weight 31 g. Flesh yellow, fine-textured, juicy, and of good flavor. Sugar content, 9.5%; ascorbic acid, 99.7 mg per 100 g. Above average quality. 1) Qing Yuan #27–cylindrical; average weight, 27.9 g; flesh yellow, fine-textured; seeds few; core small. Good for processing. 2) Qing Yuan #29–average weight, 27 g; flesh yellow, fine-textured, with small core. 3) Qing Yuan #6–average weight 27.3 g. Flesh pale-yellow and fine-textured. Sugar content 7.6%; ascorbic acid 140 mg per 100 g. Of superior quality for processing. 4) Huang Yan–yellow-skinned, cylindrical; average weight 21.9 g; flesh yellow-white, fine-textured, and of good flavor, with medium-large core. Sugar content 7.4%; ascorbic acid 170.8 mg per 100 g. Above average quality for processing. Abbott: this species was discovered in the ’20s and was first cultivated in the 1930s. The fruit has a medium size with long, soft, numerous hairs and an elongated shape. It has a light-green flesh with good flavor, and lasts for quite a few days when picked. It ripens in early May, and has horizontal styles. The vine is very productive and hardy, the petals do not overlap. It resembles the Allison variety and represents most UK kiwi exports. Monty (‘Montgomery’) – a chance seedling in New Zealand, discovered in the ’50s and was first cultivated in 1957. Petals overlap a little bit at the base, its flesh is light-green, also ripens in early May like Allison. The vine is very productive and vigorous, and the fruit is oblong and “squared” with a wider apex. There are also varieties being developed to be specifically hairless: an experimental plot with thousands of seedlings was set up in 1980 in Pukekohe, New Zealand.